It is a rainy halloween here in Chicago but it is not dampening the ghoulish spirit of the kids: Trick or treat! They are having fun. I love it. 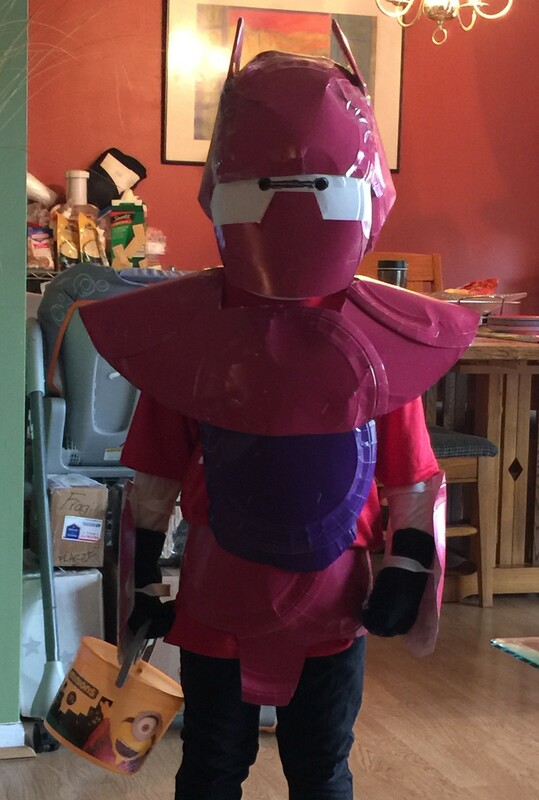 For this halloween, I made a costume of my little-man Ethan. He is fond of Baymax from the movie Big Hero 6, so I made him the armored version. I must admit I like that movie very much. So I looked for a way to make it and found one in YouTube using paper plates. I used his bike helmet too and covered it with paper plates. Here is the thin version. 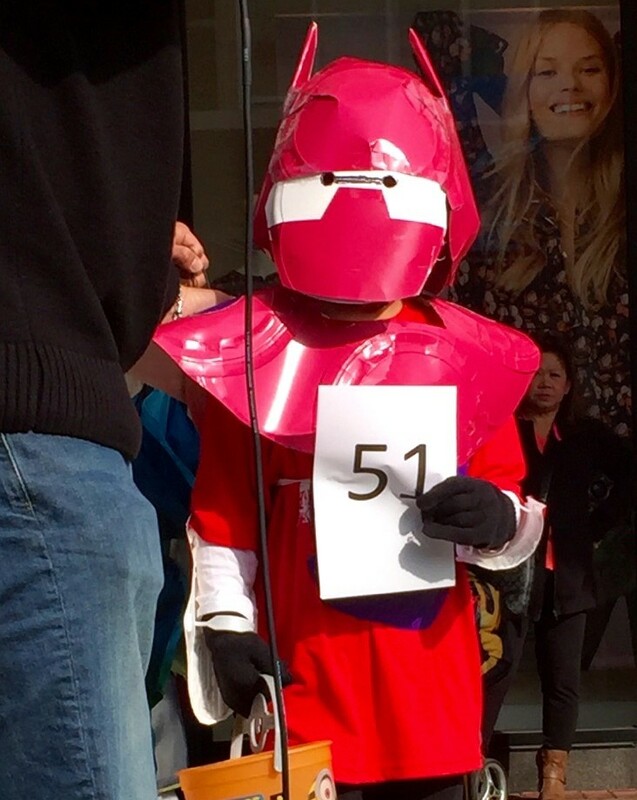 My son took him to a costume contest but he did not win. I think he was cheated. Next time I will make him a better costume to blow away the competition. He is growing up fast and is eats a lot. I am training him to become vegetarian but my family forgets. He eats tofu, broccoli, and all vegetables. His favorite snack is edemame. I taught him to say “don’t eat cows or pigs” which he tells his mom. However, he is not convinced cheese burgers are bad and made from cows. I think he gets confused. He eats vege burgers, chickenless chicken nuggets (made from soy), and meatless meatballs (also made from soy). He often asks for the meatless meatballs for dinner and of course burgers, nuggets, and meatballs are all associated with meat and poultry. Also, we are a Filipino family and if you have been to a Filipino party you would see it is not for vegetarians. Stay strong E; cows, pigs, and chickens are friends not food. Oh well. Rib pain: I have been having this pain in my left rib, so yesterday I had x-ray done to check. It maybe that my lung tumors are “disturbing” my ribs. More tests. Never ends. Hair cut: It’s halloween and my dark humors pops out once in a while. I cut my hair short, I call it the coffin look. I started my treatment again last Monday, October 19. My neutrophil count a.k.a white blood cells came back big time. It is amazing what one more week of being off chemo and proper nutrition can do. During the week loaded up on smoothies, veggies, and salad and it helped. My neutrophil count were three times above normal. My friend ChrisL think I should write a nutrition book. I would just write: eat fresh fruits and vegetables it is good for you. Eat organics, even better. It works. My mom would be a better candidate for writing a book about nutrition and cancer. Ever since I got sick she would tell me to drink this native leaves, or put this in your food, or go stand in on one leg (not true). I just spoke to her and this time she says; I read that turmeric is good for cancer, you should drink it. Or she insist: put two tablespoon lemon juice, half teaspoon baking soda in water and drink on empty stomach. Really? That’s my mom. Like a good son I will think about it. She means well, like all of you, I appreciate it. It helps when I have episodes of weariness and depression. I wish it is just as easy as drinking a get well drink. There is no shortcut to this disease. It takes you slowly. For this cycle, my doctors have reduced the dosage of my treatment. They feel I am not recovering within the normal cycle of two weeks, so they reduced it. Frankly, I don’t notice a difference. Chemo is still chemo to me: in tablet form or infused. It still makes me sick not matter what. Anyway, I got five more days of treatment, then two weeks off. So close and yet feels like a long way. Yesterday, was good news bad news day: my recent CT scan showed my tumors were “unchanged” or stable, and I can continue with my current clinical trial. Woohoo! But (there is always a “but” isn’t it? ), my blood test showed I am neutrophinic. It means I have low levels of neutrophils or white blood cells (WBC), essential for fighting infection. Low neutrophils is common among cancer patients undergoing chemo treatments. The bone marrow, which produces WBC, takes a hit during chemo. This is not the first time I became neutrophinic with my current trial; no worries, I just sit this one out. My doctors expect me to bounce back after a week. What to do? Eat more green vegetables rich in vitamin B. As you can see nutrition is really important when in treatment or just being healthy. Every green leafy vegetable counts. They are critical in providing essential nutrients to the body. I must admit I had poor eating habits before being diagnosed with cancer. Then I made the change and transitioned to become vegetarian. Now, I love fresh fruits and vegetables in all forms and organic: salad, smoothies, juice, raw, etc. It takes time, like all good things, but it is worth it. So eat your vegetables. It is good for you. Go Cubs! P.S. My doctors told me that the clinical trial drug I am currently taking, TAS-102, was recently approved by the FDA. I am glad because others can benefit from this drug. e have been through this, right? Tomorrow will be my sixth CT scan for the year. Six! I am a “walking glow in the dark” with so much radiation exposure. Ha! You can interpret this in many ways. They could not get it right so they need to do many scans. They are making money off me and my insurance so they keep on ordering these expensive scan. Ouch. They need it to see if I am responding. All can be correct if you are a cynic. However, picking number 3 would mean I am not responding to my clinical trial treatments, otherwise they will not keep on checking, right? Previously, my last scan (5th) was considered good because it says my tumors were stable and I did not get kicked out the trial. Tomorrow’s scan is another story. You can’t compare or speculate on the results. You just hope for the best, then either you jump for joy or sulk and curse, and then move on. Good scan means I stay on with my current trial; bad means…er, not good. I wish my cynicism would not take the best of me, but it gets to me sometimes. It has been a long and continuous journey with no end in sight. Oh, well. P.S. This Sunday is the running of the Chicago Marathon. Good luck, Elizabeth. You know I will be watching.